The 83 new recruits cover commercial areas such as sales and marketing, communications, people and digital, finance and purchasing, as well as engineering and manufacturing departments. Twelve graduates will follow a two-year development programme which will see them working on key business projects that will serve as starting blocks for successful business and engineering careers. 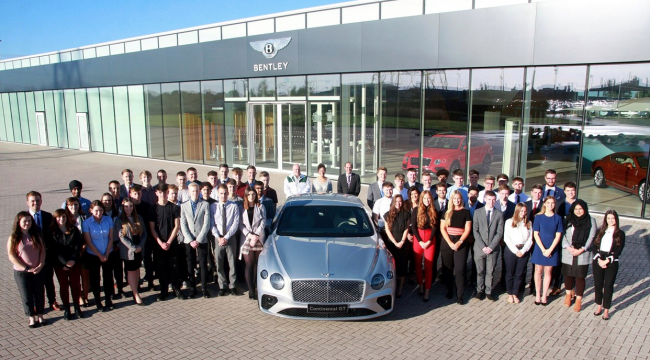 Reinforcing Bentley’s long association with apprentices, the company’s founder, W.O. Bentley himself left school in 1905 at the age of 16 to start work as an Apprentice Engineer with the Great Northern Railway. In 1919, he founded Bentley Motors in Cricklewood, north of London starting a legacy of inspiring great people to design and build cars for its discerning customers. One of the apprentices that W.O. Bentley recruited to his Cricklewood workshop in the early 1920s was Freddie Richmond, the 9th Duke of Richmond, who in 1929 went on to start his own motor racing career. This level of commitment and recognition to apprenticeships continues to the present day, with the company this year named as the UK’s Best Employer for School Leavers and Top Employer in the Automotive Industry by the School Leavers awards.